Simple enough – Remember the 2nd law of thermodynamics? Concentrated Energy disperses to less concentrated. Entropy Happens! – It just never caught on as a catchy bumper sticker, that’s all. OK, so an electrical hot wire warms the toaster which warms the toasts which safely warms my lips. Energy and all its offerings automatically FLOW if it wasn’t for it’s Arch Enemy – Resistance – (cue the sinister background music here). In the later part of the 19th Century, when Telegraph wires were strung across the U.S., scientists found that differently made cables affected the ability to receive the signals sent through them. Steel and long wires, for example, just didn’t carry the signal as clearly as short, copper wires. The Resistance to Flow had to be examined in order to receive better signals. Today in the 21rst Century we also understand how Resistance to Flow, measured in Viscosity, is also seen in liquid form. From good traffic, to land masses, to motor oil to your blood pressure, FLOW is what keeps all of our favorites working well. Let the oil gunk up in your car and see what happens to its performance. Let plaque clog up your arteries and see how it affects your VERY favorite machine. From our planet down to our phones down to phlebotomy, Flow is needed and a natural part in every system. 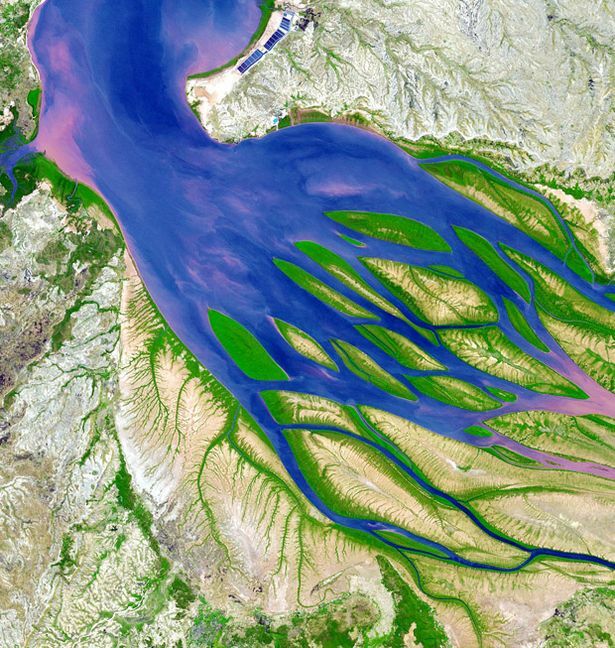 A satellite’s image of a Delta in Madagascar. Thanks to Mirror for the image. In fact, OUR very Essence of “Who I Am” depends upon clear Flow from Source Energy – (please insert whatever Label you feel comfortable with as far as your Inner Energy). The only gunk, or “mental plaque” that can slow the Flow, and create Resistance, is our own thoughts. If we can can determine the Resistance to find why something is NOT in the flow, then we have a greater chance of seeing it perform better. Of course the On/Off button is the biggest resistance to allow energy to the toaster. If the toaster still doesn’t work, aka conduct energy with the button ON, then we could measure the electrical resistance with an Ohmmeter, since an electrical unit of resistance is called an Ohm. Then we could adjust the resistance to the flow and correct the toaster to accept the energy’s momentum, and make yummy toast again. So, I just have to ask you… Don’t you find it ironic that the sound that some people exhale while meditating to calm their minds is the “OHM” sound?…. ……Perhaps they are letting all their Resistance go as they allow the flow of energy?